International Roma Day is an opportunity for those of us who know little about the Roma (often pejoratively called “gypsies”) to learn about and celebrate their culture, history and people, moving past stereotypes and media depictions. Roma people are Europe’s largest and most vulnerable minority, subject to exclusion, discrimination and hate speech. At the same time, there are efforts to overcome these barriers in EU forums, civil society and churches. In April 2011, members of Presbyterian Women joined their voices with others around the world who are concerned with justice for the Roma and published a 10-day prayer and study guide to lead up to International Day of the Roma. This is available at presbyterianwomen.org/?s=roma&post_type. Jolan Lakatos, a Romani woman from the village of Gat in Western Ukraine, was invited to the PW Churchwide gathering in 2018. 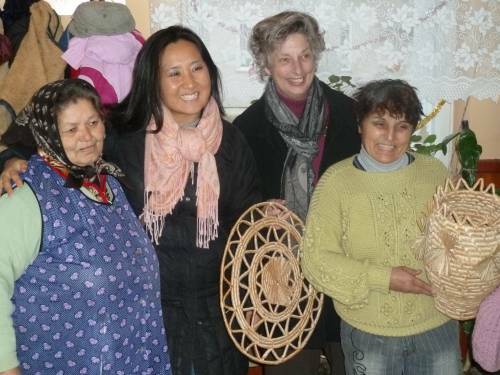 She was a teacher in her tiny preschool and lost her job but not her passion, which is finding ways to empower women in her village such as by weaving and selling baskets — a traditional skill — or by organizing a soup kitchen. Thank you, God, for life, for the fact that I’m a Rom, that I go your way with all Roma. That I look for it — the great truth, the healing truth. Thank you for the wife, for the children, that you sent me. Thank you, God, for the sun that gives life to all. Thank you, God, for the moon that brings me sleep that restores me overnight. Thank you for the forests, for the birds that every day wake me with song. Thank you, God, for health, for mine, for my children’s and everyone’s on Earth. Thank you for the cherry tree that stands by itself, alone, for her white veil, that caresses my eyes. Thank you, God, for good people, for their ample hearts. Thank you, God, for the fact that I am.